The BeWell@Work solution uses sensors and a software programme to quickly measure stress in the work environment. Two minutes is all it takes. A start-up that will be present at CES 2019 on the La Poste French IoT stand. The BeWell@Work solution developed by Codesna enables employees’ levels of chronic stress to be assessed in two minutes, without invasive procedures, and a treatment protocol to be defined where necessary. This express diagnostic fits perfectly into any “quality of life at work” process. Vasile Zoicas set up Codesna in 2014, having worked for 14 years analysing biomedical markers recorded by electrocardiogram. With the help of a scientific panel of physiologists and doctors, he developed the mathematical algorithm on which the solutions developed by Codesna are based. Marc Latouche came on board one year later, with responsibility for the start-up’s development. Based on the stress markers detected, the BeWell@Work solution enables appropriate treatments to be defined, such as osteopathy, healthy eating, reflexology, meditation, aromatherapy, neurology, and rehabilitation, until the employee’s physiological balance is restored. It was awarded the Preventica 2018 prize for innovation in the prevention of psychosocial risks. The scientific approach and the relevance of the physiological markers recorded by the application have been validated by two studies, one by the Besançon CHU (university hospital), and the other by the Nice CHU. A scientific paper on of one of these studies was published in the journal Medicine and Rehabilitation. 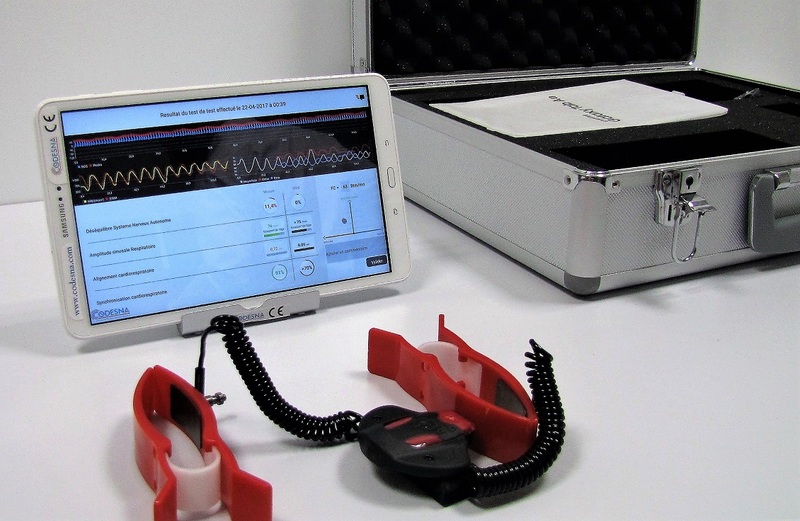 Codesna has also incorporated its technology into a software programme, CODESNA_HRV, which analyses heart rate variability and enables researchers, scientists and doctors to quickly assess an individual’s overall physiological balance, and to monitor it over time. The company plans to develop new versions of its solution, with a new sensor positioned on the finger, and cloud-based software integration, to enable more data to be processed and cross-referenced and to further boost the effectiveness of the system. It intends to raise capital early in 2019 to support this. Codesna was a winner in the French IoT 2018 acceleration programme, and will be exhibiting with La Poste at the 2019 CES in Las Vegas. More information is available on the Codesna website.